If the Clemson Tigers want to prove that the 2012 squad can be something special, they must start this weekend doing something that only one Clemson team in the last seven years has been able to accomplish. 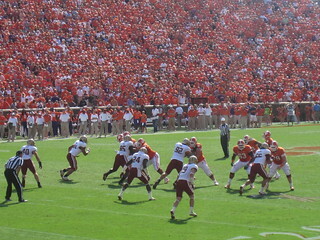 Alumni Stadium in Chestnut Hill, MA has been less than friendly to Clemson as the Tigers have only managed to win one time since Boston College joined the ACC in 2005. The Tigers will have to manage to scrap out a win without star wide receiver Sammy Watkins, who is out with a stomach virus, and wide receiver Martavis Bryant who underwent emergency surgery for a groin injury Tuesday night. Clemson still has plenty of weapons on the offensive side of the ball, but the big question that remains going into week five of the season is, does the Tiger defense have enough horses to make stops and win the game? Will the Clemson defense step up this week and take the pressure off of the Clemson offense? WHY BOSTON COLLEGE MIGHT WIN: Boston College has history and a curse at Alumni Stadium on their side, where even much more talented Clemson teams always find a way to lose. The Eagles are led on offense by junior quarterback Chase Rettig, who has improved since his first start back in 2010. Rettig has thrown for 951 yards, with six touchdowns and one interception. The Eagles’ leading rusher is Andre Williams, who has 36 carries for 117 yards. Rettig likes to spread the ball around to three different receivers, who all have over 100 yards so far this season- Alex Amidon, Tahj Kimble, and Jonathan Coleman. If the offensive line can hold Clemson’s defensive line, then Rettig can get the ball to his targets, because Clemson’s secondary has proven to be suspect many times this season. On defense, Boston College has three of the ACC’s top tacklers in Nick Clancy, Kevin Pierre-Louis, and Steele Divitto. Those three linebackers will have a huge part in determining how effective Clemson’s running game will be, especially since Clemson will be without Watkins and will be forced to just line up and run the ball. WHY CLEMSON MIGHT WIN: The Clemson Tigers have so much speed and talent on offense - with dual threat quarterback Tajh Boyd, running back Andre Ellington, and wide receivers Nuk Hopkins and Jaron Brown - that opposing defenses can’t pick just one player to key on or they will get beat by the others. This should be the case against Boston College. The Eagles have a great linebacking corps, but the linebackers can’t cover the Tigers’ wide receivers. The running game may get off to a slow start because of the Eagles’ big defensive line and linebackers, but at some point defensive coordinator Bill McGovern will have to drop a linebacker or two into coverage, opening up things Andre Ellington. The Clemson defense shouldn’t have as difficult of a time this weekend as they did matching up with the FSU playmakers, so maybe- just maybe- we will see a Clemson defense play a solid game. Clemson defensive tackles Josh Watson, DeShawn Williams and Grady Jarrett have been solid so far this season ,preventing opposing offenses from just running the ball up the middle. Linebacker Tig Willard seems to always be around the ball and in position to make a tackle. And, Clemson fans are watching a star grow before their eyes in freshman Travis Blanks. Blanks made some mistakes last week, but his talent continues to show and he is emerging as a leader on the defense. WHAT WILL HAPPEN: The Tigers will come out and try to establish the run early, but will have little success due to the Eagles’ front seven on defense. Clemson offensive coordinator Chad Morris will continue to run the ball, because as the game wears on, the Boston College defense will wear down and holes will open up for Ellington. The Clemson defense will be, well, the Clemson defense, giving up yards and points, but at the end of the day Boyd and the Tiger offense will prove too much for Eagles to handle.